For many people the morning after New Year's Eve means waddling their way to the nearest drug store to pick up a big jug of Pedialyte to, you know, bring them back to life after a night of drinking. The electrolyte-rich and rehydrating beverage meant for children has long been a trusted hangover cure. Now, at long last, the company has decided to embrace this fact by launching their Sparkling Rush powder packs: "a fizzy way to quickly replenish fluids and electrolytes lost to dehydration." And just in time for New Year's Eve. These hangover-relieving packets were designed with an "optimal balance of electrolytes and sugar to replace fluids and electrolytes more effectively than sports drinks to help prevent dehydration caused by vomiting, diarrhea, exercise, travel, and heat exhaustion," the company explains. To make the packets drinkable, all you have to do is pour them into cold water. From there, you'll have a sparkling cherry- or grape-flavored drink with 45 calories and eight grams of sugar per packet. 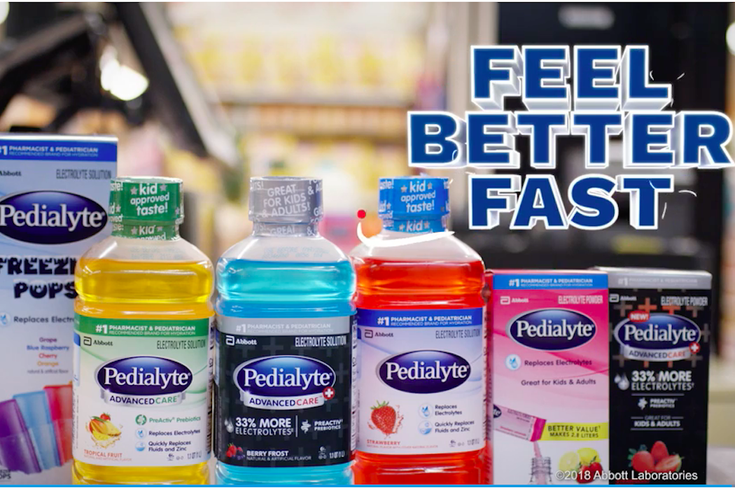 Many of the brand's online ambassadors (aka hard-drinking adults) point to Pedialyte’s claims that it works better than most sports drinks because it contains "two times more electrolytes and two times less sugar. The sugar in Gatorade, Powerade and Vitaminwater can actually make symptoms worse," The New York Post reports. It's worth noting that Pedialtye suggests that you "reconstitute only with water," for the folks who might like to kill two birds with one stone by adding alcohol to the mix. Locally, these packets are only available at Target. Double check the stock and find a Target near you here.